Ah, Summer blockbusters, I’ve missed your ridiculous budgets and ginormagantuan explosions. Welcome back, you dumb, loveable bastards. Iron Man 2 was probably one of my most anticipated films of the year. After 2008’s fantastic first instalment, I was pumped for the sequel. After all, superhero sequels don’t have to deal with the obligatory origin story, so are usually freer in terms of narrative and characters than the originals. After his admission that he is Iron Man, billionaire Tony Stark (Robert Downey Jr.) is enjoying the global celebrity the popularity of his high-tech suit has allowed. However, angry Russian bruiser Ivan Venko (Mickey Rourke) is out to take revenge on Stark under the guise of supervillain Whiplash and with the aid of crackling, fuckingmegahuge-voltage electric whips . In addition to all this, Stark’s business rival, Justin Hammer (Sam Rockwell) is trying to sabotage him at every turn. The story is great, with some fantastic dialogue and action beats throughout. I did feel that the inclusion of fan-favourite character War Machine was a little unnecessary, but passable on the fact that he’s a metal-plated arse kicking machine. Downey Jr. was on form as Tony Stark, although I did get the feeling that he may have upped the “wackiness factor” on the character, which spoiled the well-balanced personality set up in the original film. Mickey Rourke was good as Ivan Vanko, giving us a villain who’s not entirely two-dimensional, sadly still a rarity in superhero films. With an A-List cast and huge production budget, it’s no wonder that Iron Man 2 feels a little bloated at times. Not enough time is spent with Vanko to make him a tangible threat and the film focuses instead on whiny Stark-wannabe Justin Hammer (Rockwell gives a great turn as the Stark rival and makes Hammer into a character you just want to reach through the screen and throttle). Whilst he is well played, he’s clearly less interesting than the crazy Russian. War Machine isn’t really given the attention the character deserves either, but this isn’t a Venom/Spider-Man 3 type disaster. If you don’t get that reference, congratulations- you have a life. The action and set-pieces are brilliant. It’s hard not to smile at Iron Man’s intro as he rockets onto a stage of scantily-clad dancers to the gently lilting strains of AC/DC’s Shoot to Thrill. Well, unless you’re some kind of feminist who likes intelligent films or something. The standout sequence for me was Vanko’s appearance at the Monaco Grand Prix, cleaving Formula 1 cars into fine slices with his whips. It is here that Tony- suitless and scared, properly faces his enemy. It’s a fantastic, down-and-dirty fight. It’s a shame that the other action sequences fail to match up to it, with a lacklustre final showdown to round things off. In fact, Iron Man 2 repeats the mistake of its predecessor by ending in an uninspired thump-fest between hunks of metal. Still, as unoriginal as it is, it’s still entertaining and doesn’t sour things too much. Overall, Iron Man 2 is a worthy sequel, but only just. 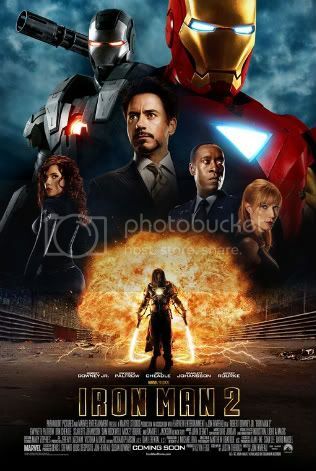 There is plenty to enjoy here (the sight of Scarlett Johansson in a catsuit is arguably worth several times the admission price alone) but it just doesn’t quite live up to the promises 2008’s Iron Man made.